I agree there should be some more direct service to Midway from the west. I’m not sure Downers Grove Metra would be the best terminus, but the Ogden segment has potential. 330 should be extended to Midway. Besides making it easier to get to Midway from west suburbs, it would have the advantage of running between the two airports. It would also allow CTA to cut some of the redundant routes along 55th. Your idea of extending the 330 from Harlem/Archer to Midway is quite intriguing. With Pace's policy of stopping every 1/2 mile in the city limits, I don't know if that would necessarily eliminate CTA's current redundancy of 62H. 55A, and 55N. But I do like this idea a lot. Current service intervals are about every 30 minutes for 330 and 20 minutes for 62H. They could run 62H between 330's so a bus comes every 15 minutes or so, similar to 63W/386. 55A and 55N could be eliminated and those riders along Austin and Narragansett can walk to 55th or 63rd. One sticking point would be whether to run 62H/330 on 55th or Archer between where those streets split and Cicero. This would depend on how many riders the current routes have in that segment. One option would be to keep 62 on Archer with 62H/330 on 55th. Another would be to leave 62H on its current routing while 330 covers 55th. The main problem I can see with this is that 330 is already a long route, and congestion on its north end could cause delays, which might make the people along 55th react negatively to this proposal. There already is route 834. Used to be route 312. Was canceled. Parallels the BNSF, and could transfer at Cicero Ave.
Beside the aldercreature not allowing the latter, there usually are airport bus companies serving the airports. People have somehow found the way to use Southwest Airlines. BTW, the fact that the Pace budget funds a study on how to utilize the Joliet TC isn't an opening to play route fantasy again. On something actually related to the 2019 budget, the Pace home page says that 681 and the Round Lake on Demand were taken off the cancellation list, giving the communities until next year to "find solutions to increase ridership and, hopefully, save them." ...which ends it in my book. Nah nah nah, why don't you analyze the route suggestion for a second? It's a direct connection to Midway from Downer's Grove via Lyons and Stickney. Not only that but it could greatly serve for a good variety of reasons. 1. To go to Midway from Stickney and South Berwyn, or even just to go to Cicero Avenue right now can be a hassle since one has to walk all the way to Harlem, take 307, take 62H, and the whole trip would take about 45mins including waiting times. Could vary depending on the traffic. A direct route to Midway from the North side of I-55 and the Chicago Sanitary and Ship Canal can help with easier access to the airport, the Orange Line, and other CTA and Pace bus routes. 2. There is no bus service between LaGrange Road and around Downer's Grove along Ogden Avenue. By adding the route I am suggesting (not imaginary since you hate the word, @Busjack), this would serve many of the residential areas in that service gap between routes 722 and 302. There are businesses crossing I-294 into DuPage County people, possibly even senior citizens, should be able to have access to. 3. To access Cicero Avenue just to head south on Cicero from South Berwyn / south side of Town of Cicero, one has to take a Pace route north to Cermak, take 21 and transfer to 54B. Seems like a ridiculous travel pattern. Pershing Road NEEDS A BUS to transport people along the industrial part of Pershing between Morton College and Cicero Ave. There is a Wal-Mart on Cicero and 33rd as well. Seems convenient, but the major reason it was killed off or never fully implemented is the extremely low actual ridership levels. After all, it costs an astronomical amount of money to implement such a route only to see fewer than 10 people take it on an average weekday. So, you can't implement a route without the heavy ridership prediction that is needed to sustain continued service along that route. I'd say at least make it a Pulse route. Have it make limited stops. I wouldn't say it would serve just three or four people but I guess the only way to find out is if Pace were to conduct a study along Ogden and Pershing Roads. I wouldn't say this is urgent but hopefully this could be an idea that can be used in the future. And wasn't route 312 only from Harlem + Ogden and 31st St? And the reason why it was eliminated was not just due to low ridership, but it was deemed too close (distance-wise) to the higher-ridership #302. The very same reason is why route #304 is now being eliminated. It always was kind of weak past riverside towards the zoo. Once they killed cermak they killed that route. With all these cuts they might actually be able to finish off retiring the 6162s. I'm surprised west has them but maybe they have enough that they can rotate them. Pace actually is not doing too bad. If they can get the Pulse service off the ground level they will have some pretty good service. Looking at the long range plans with Pulse its really highly ambitious but it makes sense. If they could get more shoulder service that together with Pace Express will be a force to reckon with. The tri state is terribly congested. That needs a shoulder service now. They could actually establish a south suburbs Rosemont corridor. With ohare nearby it's an attractive destination. With all these cuts they might actually be able to finish off retiring the 6162s. Not enough cuts there to wipe out about 70 buses (including white NABIs still around). Most are weekend only, which doesn't save any buses. Only weekday ones that use 40 ft buses are 304 (1 bus), 326 (2 buses), and 362 (1 bus). Arguably some 30 ft. buses could be moved back to NW, but that picks up about 4 to 6 buses. 10 buses aren't 70. The tri state is terribly congested. That needs a shoulder service now. Tri State between Balmoral and 95th is supposed to be rebuilt to Smart Road standards. Don't expect anything until then. They could actually establish a south suburbs Rosemont corridor. With ohare nearby it's an attractive destination. Obviously, not. 889 failed miserably (most trips didn't leave Blue Island), and the only thing remaining from that CMAQ project is 895. The 6162s are not going anywhere until the next batch of El Dorados come in, which won't be until next year and into 2020. And even then, Pace still has to think about the 6262s and the early 2600s in Fox Valley, which are also approaching retirement age. Pace is known to be slow in retiring buses so that pattern won't be changing anytime soon. They'd rather move buses around that still have good life to them. It's why you see more 6162s and 6262s out on the weekends, at least lately, to preserve the El Dorado 40 footers for the long haul. 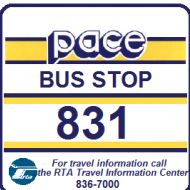 889 was an express route from the south suburbs to Rosemont. Service started November 30, 2009 and lasted only until March 8, 2010. If there were no passengers on board after Blue Island, the bus would go back to the garage instead of driving all the way to Rosemont empty. This was happening on most trips at the time it was cut. The 6162s are not going anywhere until the next batch of El Dorados come in, which won't be until next year and into 2020. We don't even know that. Add together that the budget hasn't said anything about 40 foot buses (but I know those discrepancies) and the contract has not been let in the Oct. and Nov. board meetings, I wouldn't expect anything until at least 2020. 6210, 6227, 6235,6237 6240, 6251, 6255, 6257, and 6259 along with 6651. Wayback Machine was my first thought as well, I was going to post the schedule here. The route was so short-lived that no archive was made of them. I believe 889’s routing on the south end was the same as 877. RTAMS said there were 30 rides per day in February, and I wonder how many were suburban local trips (which 877 has some of now). Yeah this is what I was referring to. They cant retire those. I think alot of what's on the roster are spares. Eldorkos couldn't help wipe those off the radar? 10 buses may be all they need.